Background: With the increasing use of nail paints, nail art, acetone, repeated manicures, cosmetic nail procedures and detergents, the nail plate undergoes regular damage resulting in rough, lusterless and pigmented nails. Besides that onychomycosis, nail lichen planus, nail pitting and ridging due to various diseases also cause cosmetically disfiguring nails. Objective: The study is directed toward use of 70% glycolic acid for controlled keratolysis of the nail-plate, resulting that could result in shinier, smoother and brighter nails. Materials and Methods: A prospective single-center open-label uncontrolled study of 31 patients, 22 with dry, rough, discolored nails and 9 with hyperkeratotic nails were included in the study group. After examination and ruling out any infection, petroleum jelly was applied on the cuticle margins of the nails for protection and 70% glycolic acid was applied over the nail plate for 45 minutes. In dry rough discolored nails, only a single sitting was done while in hyper-keratotic nail conditions multiple weekly sittings were done. 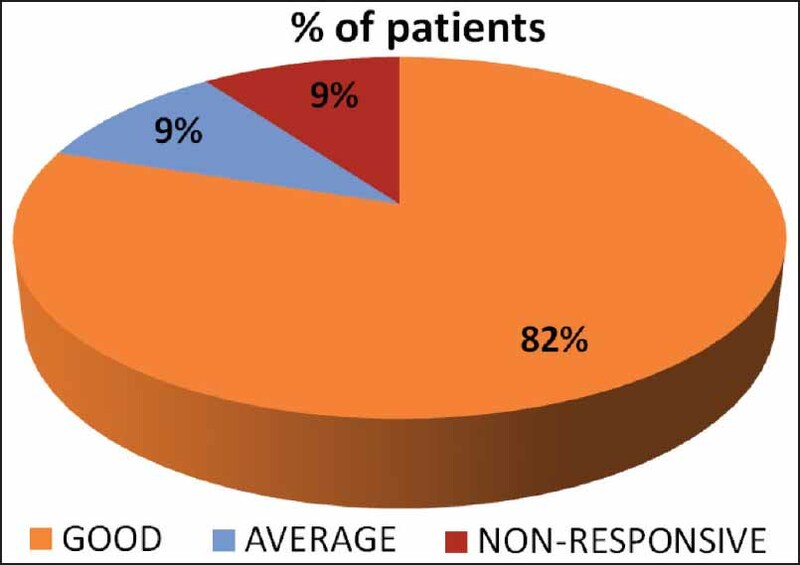 Results: In 22 patients with dry rough nails, 80% showed good improvement, 10% showed average improvement, whereas 10% were non-responsive. Nine patients with thickened nail plate showed good improvement in 60% average improvement in 25% improvement and 15% were non-responsive, after multiple sessions. 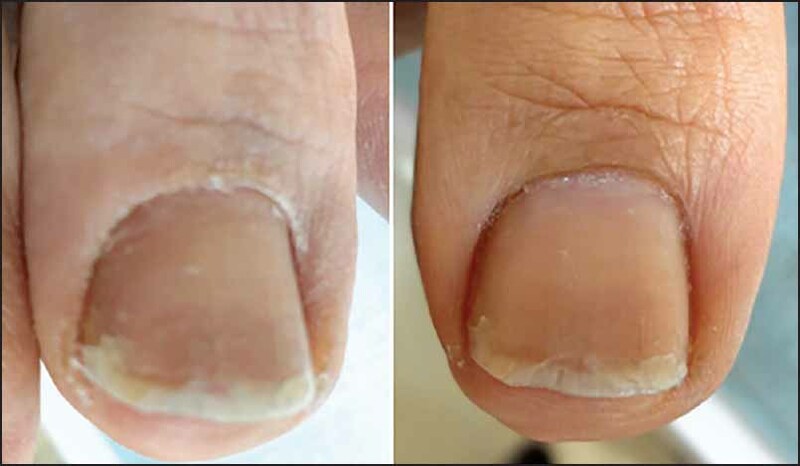 Conclusion: Controlled keratolysis of the nail plate with application of 70% glycolic acid can be a promising treatment for modality for thick, uneven, rough and pigmented nail-plate conditions with cosmetically pleasing results. In recent times, there is an increased awareness about the appearance of nails and people are becoming more and more conscious about how they look. Nail decoration is a regular part of grooming which leads to repeated manicures and regular use of acetone on nails and nail chemicals. There is increased incidence of rough, dull and discolored nails due to excess chemical abuse,  along with various other factors like detergent exposure. Different pathological conditions like onychomycosis;  lichen planus (LP), psoriasis, twenty nail dystrophy;  underlying systemic conditions like hepatic, renal and cardio-pulmonary disorders, multiple nutritional deficiencies and senile idiopathic wear and tear conditions like onychogryphosis, striations, uneven texture and idiopathic onycholysis also cause nail changes. Though patients understand that involvement of the nail is a part of another cutaneous disorder, treatment of which is more important yet patient's cosmetic concern for nail appearance cannot be ignored. In most of these conditions, either the upper layer of nail plate is damaged or thickening of nail plate (hyper-keratosis) occurs. Glycolic acid (GA) is being used as a keratolytic agent in various skin conditions for many years as it has the minimum molecular weight among all alpha hydroxy acids, and hence good penetration. Controlled keratolysis leads to cosmetically better looking and clinically improved nails. Other properties of GA are as a humectant  and a good exfoliating agent. It is also used as a chemical enhancer to facilitate transungual transfer of drugs,  by breaking down the disulfide bonds of nail keratin leading to an increase in nail hydration and permeability. 0A prospective, single-center open-label uncontrolled study was conducted at our center between June and October 2013. 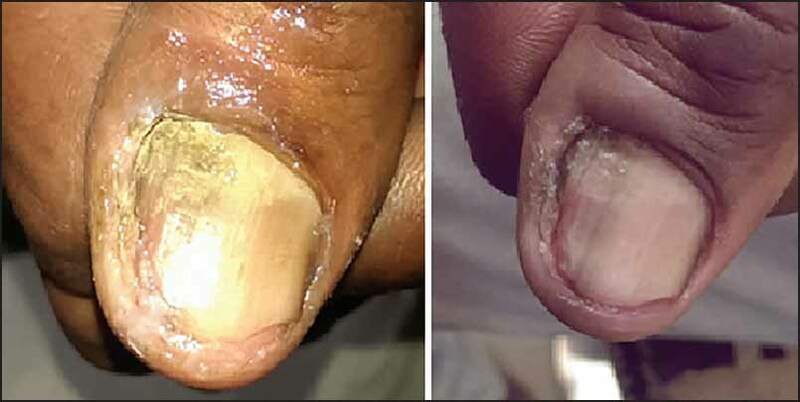 A total of 31 cases were taken and were divided into two groups: 22 cases with dry rough discolored nails and 9 cases with hyper-keratotic nail conditions (7 following onychomycosis and 2 with nail LP). Hyper-keratotic nail plates due to onychomycosis, LP. Pitted nails, nail ridges due to nutritional deficiencies and aging. Any active infection or inflammation in or around the nails. History of hyper-sensitivity to GA. Written consent was taken from the patients, informing them about the procedure, possible side effects like burning sensation, dryness and peeling and expected outcome of improvement in nail texture only and not in their pathological condition. Consent was taken to take the pictures and to use them for our study. Evaluation was done to rule out any active bacterial or viral infection in or around the nail. After cleaning the nail with plain water, petroleum jelly was applied on all the cuticle margins of nail plate with the help of cotton bud to protect the peri-ungual soft tissues. Possibility of local complications is higher if the cuticle margin is not well protected or if acid dribbles on the surrounding skin. After securing all the cuticle margins, a proprietary preparation of GA 70% with a pH of 1.5 was applied over the nail plate with the help of a cotton bud. In rejuvenation for dry and dull nails, Group 1 single coat of chemical and in pathological nail conditions (Group 2) 2-3 coats were applied depending upon the nail-plate damage. Leave on period was kept at 45 min followed by washing with plain water. For rough discolored nails, only single sitting was done, while for hyper-keratotic nails, multiple sittings at weekly intervals were done. Number of sittings depended on the nail thickness. In single sitting of GA application, patients were advised to use aloe vera-based moisturizer without urea and lactic acid twice daily while in hyperkeratotic conditions standard medication protocol to treat the underlying disorder was to be continued along with moisturization. In dry rough discolored nails results evaluated after 2 weeks, while in hyperkeratotic conditions weekly repetition was done for 6-12 weeks. Patient's satisfaction was graded on the scale of 0-5. In dry rough discolored nails, evaluation was done after 2 weeks. Eighteen patients had good results 2 patients had average results and 2 cases showed no response [Figure 1], [Figure 2] and [Figure 3]. 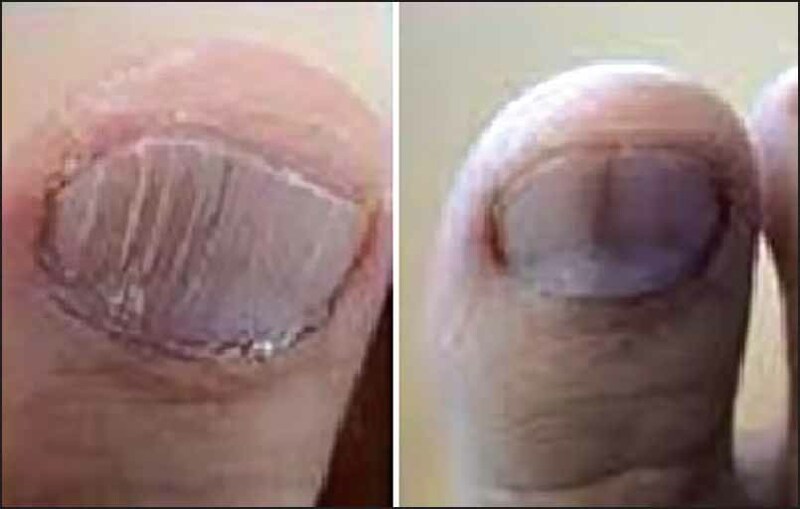 In hyper-keratotic nail conditions, multiple sittings were done at weekly intervals ranging from 6 to 12 sessions depending on nail-plate thickness and evaluation was done after 2 weeks of last sitting: Six patients showed good results (all of onychomycosis); two patients, showed an average reponse. Average results (one of onychomycosis and one of LP) and one patient with lichen planus did not respond [Figure 4] and [Figure 5]. Adverse effects and complications observed were mostly mild and tolerable. There was mild burning sensation, dryness and peeling in and around the cuticle in three patients. No patient withdrew from study and all completed their treatment protocols. Nail plate is made up of keratinized epithelial cells (anuclear, flattened corneocytes devoid of organelles). In chemical abuse as well as in pathological conditions, maximum damage occurs in top most layer of nail plate causing cosmetically disfigured nails. This study was mainly focused on cosmetic improvement for chemically insulted nails as well as hyper-keratotic nails due to various medical conditions. Out of total of 31 patients 22 had no pathological nail conditions and there were only cosmetically disfigured nails. Only nine patients had pathological nail conditions, seven being of onychomycosis and two being LP. Five patients of onychomycosis were on terbinafine and two were on itraconazole, while patients with LP were using only topical steroids. Patients were advised to continue the medical treatment taken by them at the time of the study. They were fully explained that this peel is for cosmetic improvement of nails and has no effect of the medical treatment. We used GA as the keratolytic agent, that softens, separates, and causes desquamation of the corneocytes. In onychomycosis, clinical cure often occurs later than mycological cure and cosmetic disfigurement may persist despite mycological cure. Keratolysis will enhance penetration of topical antifungal like amorolfine nail lacquers and may act synergistically with systemic and/or topical anti fungals to expedite cure and may reduce the lag period between mycological and clinical cure, resulting in aesthetically pleasing nails for the patient. Controlled keratolysis of the nail plate with 70% glycolic acid can be a safe, well-tolerated treatment modality for thick, uneven, rough and pigmented nail-plate conditions because of myriad of insults, chemical abuses and pathological conditions. In such patients, GA 70% peels can offer aesthetically better looking nails. However larger studies with a longer follow up are required to validate the results. Baran R, André J. Side effects of nail cosmetics. J Cosmet Dermatol 2005;4:204-9. André J, Achten G. Onychomycosis. Int J Dermatol 1987;26:481-90. Holzberg M. Common nail disorders. Dermatol Clin 2006;24: 349-54. Dewandre L. The chemistry of peels and a hypothesis of action mechanisms. In: Rubin MG, editor. Chemical Peels: Procedure in Cosmetic Dermatology. Elsevier Inc; 2006. p. 1-12. Hao J, Smith KA, Li SK. Chemical method to enhance transungual transport and iontophoresis efficiency. Int J Pharm 2008;357:61-9. Van Scott EJ, Yu RJ. Hyperkeratinization, corneocyte cohesion, and alpha hydroxy acids. J Am Acad Dermatol 1984;11;867-79.